Designated as a wilderness area in 1984 to protect is natural beauty, the Granite Chief Wilderness encompasses glacier carved valleys, red fir forests, granite formations, and pristine mountain meadows. Several major streams drain the area, and the northwest section of the Wilderness is part of the French Meadows Game Refuge. The area is served by a substantial trail system used by both hikers and equestrians. 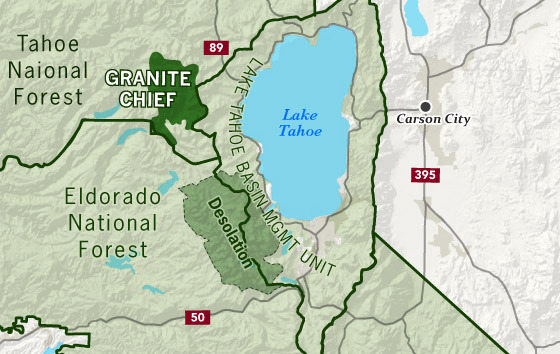 Most of the use originates from the east or Lake Tahoe side because of the ease of access and because of the population and recreation visitor base. The Pacific Crest Trail crosses the area north-south for about 21 miles along the eastern boundary passing through Five Lakes Basin. The Five Lakes Trail crosses near the middle of the Wilderness, and from the Basin, follows Five Lakes Creek for about nine miles to Hell Hole Reservoir. Away from Five Lakes, the Wilderness receives light human use, a great attraction for solitude seekers. Elevations in the Granite Chief range from 5000-foot valleys to 9000-foot peaks. Summers are typically warm and dry, though nighttime temperatures can be cold and afternoon thunderstorms often build over the mountains. A wilderness permit is not required for overnight visits to the Granite Chief Wilderness, however some other rules and regulations do apply. Five Lakes Basin: Camping, fires and stoves are prohibited within 600 feet of any of the lakes in the Five Lakes Basin (NE corner of wilderness, just above Alpine Meadows. Whiskey Creek Structures: Camping, fires and stoves are prohibited within 250 feet of the Whiskey Creek structures (less than one mile southwest of Five Lakes on the Whiskey Creek trail). Group are limited to 12 persons (day and overnight use). Why? Food and refuse must be properly stored at all times. Use the Bear Section on this site to learn more about proper food storage methods and protecting Sierra Black Bears. Campfires and gas stoves are permitted with a valid California Campfire Permit. When wildfire danger is high, you may be restricted from building campfires, using stoves, or smoking. Check the Tahoe NF Fire Restriction Status page for more info. The headwaters of the American River, this wilderness is an isolated pristine Sierra landscape only a short distance from the Lake Tahoe basin.